1933 New York Safety Sticker - $20.00 : Bob Hoyts Classic Inspection Stickers, Add a Final Touch to your Restoration! 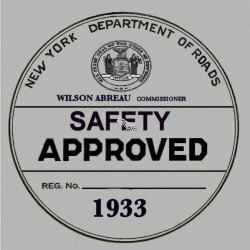 This 1933 New York Safety sticker was reported to be used used for roadside checks and by car dealers to cooperate with the cause of safety. It was not originally a sticker, it was a certificate. We have created it as a sticker for you to use on your cars.